Follow Me.Hand it All Over - Follow Me. Give me all of eternity to try to grasp it, and I will never understand one simple fact: As a priest, Jesus chooses to literally place himself in my hands every single day when I celebrate Mass. Why me? Why any human, other than Mary? In the Eucharist, Jesus is abused, ignored, received by people who have chosen to abandoned him through mortal sin, occasionally dropped on the floor or left in a pew. I can’t tell you how many stories of neglect and abuse of the Blessed Sacrament I’ve heard. Yet he still chooses to give himself to us. Of course, there are people all around the world – especially today – who do their best to give our Eucharistic God the honor and worship that he deserves. 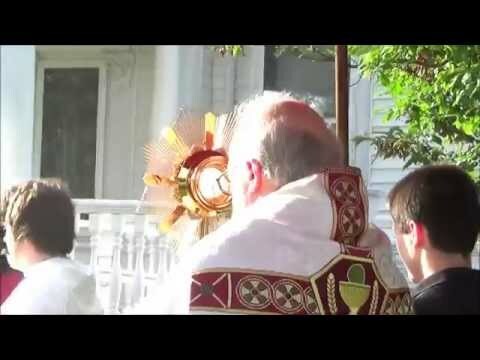 They adore the Blessed Sacrament, make reparations for abuses against the Eucharist, hold Eucharistic processions and congresses, or simply stop by their Church for a few minutes to look at the tabernacle and tell Jesus that they love him. 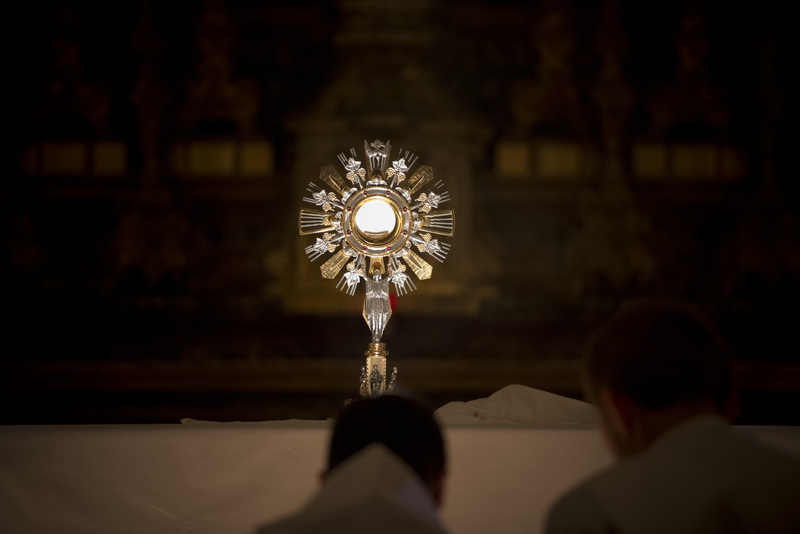 There are entire religious orders dedicated to perpetual adoration (here’s one) and the number of adoration chapels in parishes seems to be growing (see here for a complete directory). Jesus asks for our love and adoration. He elicits it through his own words and actions. He even commands it – because he justly deserves it and because he knows its essential for our eternal life. But he never forces adoration. He would rather it be freely given. So he continues to risk abuse and neglect by placing himself in sinful human hands, because our love is worth that much to him. In the Gospel for today, we hear Luke’s telling of the miracle of loaves and fishes. It seems like, the farther I get in my ministry, the more I feel like the apostles who stand dumbfounded, looking at the crowds and wondering how they will accomplish the impossible task of feeding all those people. 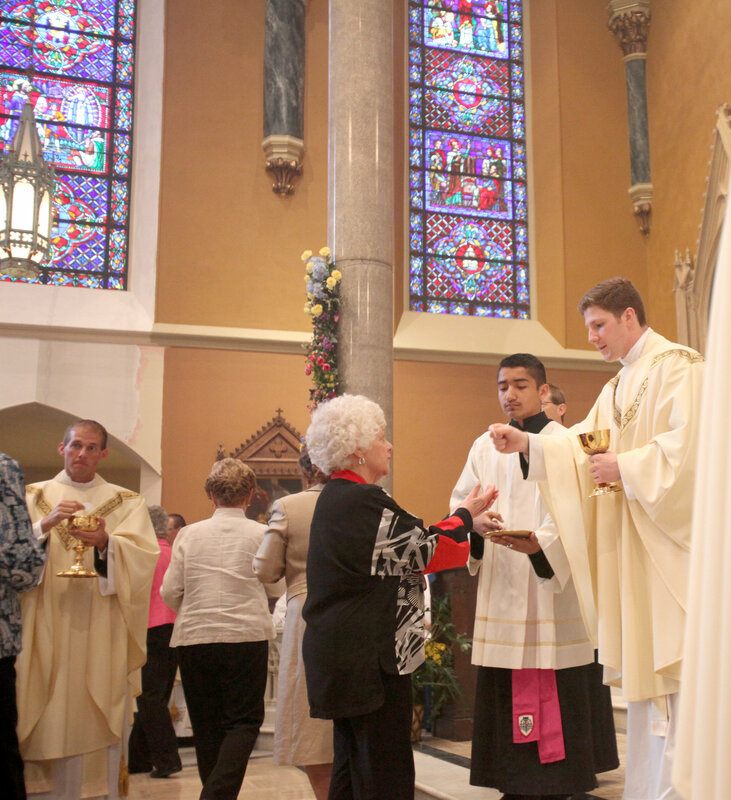 Then I hear Jesus turn to me and say, “Give them some food yourselves.” I look at what God has asked me to do – whether it’s serving a parish or seeking out priests for the future of the diocese – and I realize the impossibility of it. But his words echo, “give them some food yourselves.” So I scrape up the scraps – my own poor talents and abilities, and my sinful self – and I give it to Jesus. This is the point where Jesus does two seemingly contradictory things: he blesses us, and he breaks us. Without these two things – loving us, and letting us be crucified (or at least suffer the little pinpricks of life) – we cannot accomplish what he’s asking of us. The whole time, though, we learn that it’s not about us. It’s Jesus’ himself who will actually be taken, broken, and given to his people. It’s Jesus who will not only give them some food himself, but who will give himself for food. When faced with the impossibility of our vocations – and be assured that, whatever your vocation, it is impossible in human terms – we have three options. We can turn and run from the challenge. This is cowardice, and it leads to a life that is stagnant and sterile and boring. We can run toward the challenge by ourselves and try to respond to it solely with our own resources. This is pride, and it leads to us falling and being broken (which isn’t a bad thing if that brings us back to Christ). The third option is that we can run to Jesus and place everything we have and everything we are in his arms. The perpetual mistake that we make in our prayer lives and in our vocations is taking our eyes off Jesus and losing trust in Him. If you are discerning, know that trust in Jesus is the foundation for all discernment. But also realize that this trust will constantly be tested and purified, and that the need for trust will never end – it will only grow. Right now you are seeking to entrust yourself to him. Later on, you will have to entrust your whole family, community, or parish to him. A vocation requires responsibility not just for one’s own self, but for a group of people. This is why Jesus was gently teaching the apostles – the future shepherds of the Church – that they can’t do anything for the Church without first entrusting their actions to Him. I pray that we can all spend some time in front of our Eucharistic Jesus today, contemplating the immensity of his self-gift. God, who is infinitely beyond all creatures and who holds us in being, sits in our tabernacles and comes to our altars just so that we can love Him. He places Himself in the hands of the priest and in the bodies and souls of His people. All he asks in return is that we place ourselves and our vocations in his hands, so that he can bless us, break us, and give us to others. What an incredible gift we have in the Eucharist. How can we not make so small of a return?